We’d love your help. 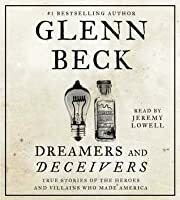 Let us know what’s wrong with this preview of Dreamers and Deceivers by Glenn Beck. The new nonfiction from #1 bestselling author and popular radio and television host Glenn Beck. Everyone has heard of a “Ponzi scheme,” but do you know what Charles Ponzi actually did to make his name synonymous with fraud? Credit for inventing radio usually goes to Marconi or David Sarnoff and RCA—but if you’ve never heard of The new nonfiction from #1 bestselling author and popular radio and television host Glenn Beck. Everyone has heard of a “Ponzi scheme,” but do you know what Charles Ponzi actually did to make his name synonymous with fraud? Credit for inventing radio usually goes to Marconi or David Sarnoff and RCA—but if you’ve never heard of Edwin Armstrong or Lee de Forest, you know only half the story. You’ve probably been to a Disney theme park, but did you know that the park Walt believed would change the world was actually EPCOT? He died before his vision for it could ever be realized. History is about so much more than dates and dead guys; it’s the greatest story ever told. Now, in this powerful follow-up to his national bestseller Miracles and Massacres, Glenn Beck brings ten more true and untold stories to life. The people who made America were not always what they seemed. There were entrepreneurs and visionaries whose selflessness propelled us forward, but there were also charlatans and fraudsters whose selfishness nearly derailed us. Dreamers and Deceivers brings both of these groups to life with stories written to put you right in the middle of the action. You know that Woodrow Wilson was a progressive who dramatically changed America, but did you know that he was also involved in one of the most shocking national deceptions of all time? You know I Love Lucy, but the true story of Desi Arnaz and Lucille Ball is much better than anything they produced for television. You’ve heard of Upton Sinclair, the socialist author who gained famed with The Jungle, but it was a book he wrote two decades later that proved the depths he was willing to go to maintain his reputation. To ask other readers questions about Dreamers and Deceivers, please sign up. Dreamers and Deceivers However these two books came together, it worked. 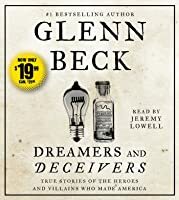 Dreamers and Deceivers is another winning collection of short stories chroni Does Glenn Beck write his own books? I doubt it's possible. I believe his role is more like that of a film director or even a producer. With Miracles and Massacres and his latest offering Dreamers and Deceivers, I believe he picked which stories were to be told, what details were to be emphasized, and what the overall effect on the reader was to be. Dreamers and Deceivers However these two books came together, it worked. Dreamers and Deceivers is another winning collection of short stories chronicling the lives of several individuals who made significant marks on our history. Some of them would be characterized as "good guys" and others would be "bad guys." The first story in Dreamers and Deceivers &emdash; "The Mysterious Case of the Disappearing President" &emdash; stands out from the rest of the stories in the book because it doesn't really establish a strong antagonist or protagonist. It does, however, seem incredibly relevant given today's headlines and the public's increasing distrust of the government, particularly the Executive Branch. Chapter five's story of Desi Arnaz, the on-screen and real-life husband of Lucille Ball, was one story that really stood out for me. His backstory as a refugee fleeing communist Cuba for America where he had to start over from scratch as a young boy has all the trappings of a quinticential American success story. Arnaz's fear rooted in his family's losses in Cuba that good things never last was a self-fulfilling prophecy in his life. Desi Arnaz's story is inspiring, but sad. The seventh chapter was about early computer scientist Alan Turing. I'm sure this was a frustrating story to write without boring the non-technical reader with technical details that would fly over their heads. As a technical reader, I craved more of the technical guts that were excluded. Beck and Co. did a great job covering the necessary bases to produce a mostly accurate story of Turing's rise and unfortunate fall. There are some links between the otherwise standalone stories that I enjoyed catching. The story on journalist Upton Sinclair in chapter six provides some great background for the story on state-department-diplomat-turned-convicted-communist Alger Hiss in chapter eight. Probably one of the best books of history that I have read in several years. Do yourself a favor and don't get bogged down by who the author is... take it at face value and read it for the content alone. Each chapter is a condensed telling of history as it relates to the Subject or Persons, around who the story revolves. This is without a question my favorite Glenn Beck... and one of my favorite reads this year. This is the kind of book which reinforces my belief that this country is racing to the bottom of the intellectual barrel. As a few other reviewers have pointed out the entire book consists of imagined, made-up events and conversations "based" on historical events. However, this fact is not revealed anywhere on the cover or in a Prologue, but rather at the very back of the book in a lengthy "footnote" chapter that reveals, practically page-by-page, all of the pretend history in the book. How many This is the kind of book which reinforces my belief that this country is racing to the bottom of the intellectual barrel. As a few other reviewers have pointed out the entire book consists of imagined, made-up events and conversations "based" on historical events. However, this fact is not revealed anywhere on the cover or in a Prologue, but rather at the very back of the book in a lengthy "footnote" chapter that reveals, practically page-by-page, all of the pretend history in the book. How many read that chapter? This book is to learning history as is "eating healthy" at McDonald's or being "into sports" by virtue of wearing an NFL team sweatshirt while lounging on the couch. It is all pretend. However, reading this book for history is worse than comparing fast food to dining, because it creates a false sense of historical knowledge, when in fact, all that has been accomplished is the reader has been fleeced for $19 +/- and Mr. Beck can watch his pile of $90 million (Forbes 2014) get higher, while the dumb sheep who buy this crap stay poor and uneducated. 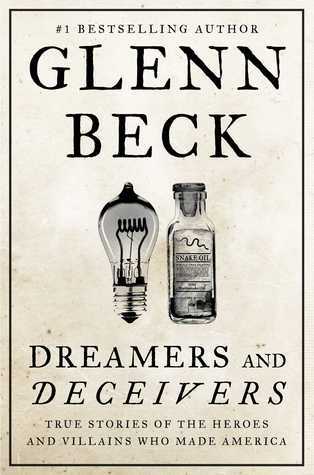 Glenn Beck writes about people who influenced America. I enjoyed hearing about people who did things which inspired names such as "Ponzi scheme" and how the name came about. I learned about Edison and Tesla a while back, thanks to Glenn's show, and was saddened to hear what a creep Edison actually was. Very interesting and worth reading. Like a historic gossip magazine. Even had America's favorite married couple!!! I was listening to this book when I went to bed night before last, and a lot of discussion about Steve Jobs was going on, also Desi Arnaz, and others during that time frame. I was kind of disappointed that Glenn Beck did not narrate his own book. I've followed him quite a bit over the years, and have enjoyed the ones he has done himself and narrated himself. Got the feeling he had help with this one as it didn't seem like his own work. I feel like Glenn Beck could be cast as a deceiver for advert I was listening to this book when I went to bed night before last, and a lot of discussion about Steve Jobs was going on, also Desi Arnaz, and others during that time frame. I was kind of disappointed that Glenn Beck did not narrate his own book. I've followed him quite a bit over the years, and have enjoyed the ones he has done himself and narrated himself. Got the feeling he had help with this one as it didn't seem like his own work. I feel like Glenn Beck could be cast as a deceiver for advertising this book as non-fiction when it is in fact historical fiction. The entire book consists of historical events but in the disclaimer at the end of the book it is confessed that they altered quotes, made up dates, and added pretend dialogue/situations. This message should have been placed as a forward to the book not as an afterthought in the back. Charles Ponzi ripped people off because both he and his victims thought that America presented an opportunity to get rich quick with very little work. By contrast, Desi Arnaz worked hard and was fortunate to marry a talented wife. (His contribution behind the scenes was often underestimated, though: Desi Arnaz practically invented the TV rerun.) In his personal life, Arnaz was a womanizer who ended unhappily without the woman he really loved. The founders of the award-winning animation company Pixar, for example, had both been spurned by the companies where they had had their dream jobs, and yet, through Pixar, they not only rediscovered their passions but eventually worked their ways back into their original jobs--only when they returned they were more successful than before. There are also heroes within each story of a villain. Sometimes people are part hero and part villain. We learn that someone risked everything to expose a presidential lie and his reputation suffered. Beck does not dwell on it, but perhaps tacitly acknowledges that the president in that case, Grover Cleveland, had a good reason for lying to the American people, but did this justify either the perpetuation of the lie or the destruction of a man's reputation? Despite my husband's disapproval for Glenn Beck, I chose to read this book anyway. (My husband (and I, for that matter) don't like how Beck has a tendency for twisting the truth, especially with reports on Fox.) I knew, though, after seeing the reviews on Goodreads I was going to have to read it. And I will say that I absolutely enjoyed this collection of historical accounts. Beck did change some minor details in each story, but fully explains why at the end of the book in the "About" section. He Despite my husband's disapproval for Glenn Beck, I chose to read this book anyway. (My husband (and I, for that matter) don't like how Beck has a tendency for twisting the truth, especially with reports on Fox.) I knew, though, after seeing the reviews on Goodreads I was going to have to read it. And I will say that I absolutely enjoyed this collection of historical accounts. Beck did change some minor details in each story, but fully explains why at the end of the book in the "About" section. He also labels this as Historical Fiction, so I can't see why anyone should complain. With all of this being said, Beck's writing style is outstanding. He kept me intrigued in each story and I kept looking forward to the next one as I read more. The pacing of each story was well thought out and I never thought any story was being told too fast or slow. My favorite accounts were of Charles Ponzi, Edwin Howard Armstrong, Alan Turring, and, undoubtedly, Walt Disney. My only issue with this book is that all of the stories are based on individuals who made impacts on America in the early to mid-20th century, with the exception of Grover Cleveland and Steve Jobs. I wish more innovators from the 19th century had been highlighted, as well. However, as this was my only problem with this book, I would have to say it's a great read indeed. I would recommend to all history lovers. While I did enjoy this book and found it incredibly interesting, I feel like Glenn Beck could be cast as a deceiver for advertising this book as non-fiction when it is in fact historical fiction. The entire book consists of historical events but in the disclaimer at the end of the book it is confessed that they altered quotes, made up dates, and added pretend dialogue/situations. This message should have been placed as a forward to the book not as an afterthought in the back. I really enjoyed the format of this book. Each chapter was a new story of a dreamer or deceiver. I learned about a lot of different people without having to read an entire book on each of them. Just the important information--quick and succinct. Each chapter is a different famous person in history. It's a kind of "rest of the story" book, telling little known background info on people like Steve Jobs, Charles Ponzi, Walt Disney, Woodrow Wilson, Henry Ford, et al. Rich reading. Would read it again as time permits. A fun book!! I highly recommend! The problem is the spin that these stories have. I'm not even knocking Glenn Beck's agenda, opinions, and politics. What I am saying is that the angle these stories are spun at makes them difficult to choke down. A friend let me borrow this book. Stories are mixed with facts and "scenes that were imagined or expanded beyond the basic historical record." I was already familiar with stories about Desi Arnaz, Lucille Ball, Steve Jobs, Walt Disney and Alan Turing. I found the material supportive to what I already knew yet still garnered a few new facts. It was interesting to read details about events surrounding older historical figures (Upton Sinclair, Charles Ponzi, Alger Hiss, Woodrow Wilson and Grover Cl A friend let me borrow this book. Stories are mixed with facts and "scenes that were imagined or expanded beyond the basic historical record." I was already familiar with stories about Desi Arnaz, Lucille Ball, Steve Jobs, Walt Disney and Alan Turing. I found the material supportive to what I already knew yet still garnered a few new facts. It was interesting to read details about events surrounding older historical figures (Upton Sinclair, Charles Ponzi, Alger Hiss, Woodrow Wilson and Grover Cleaveland) that I knew their name but not so much about the ordeals Mr. Beck focused on. This was a great read about stories in history that I knew little about. I knew some of the stories, but not all the details. Others, I only knew the name for some reason but couldn't remember why that name was important. Great readable stories written like a novel but backed up by the historical record. I love the fact that at the end of the book, it separates what was invented, based on the historical record, for the purposes of the story and what is taken directly from a source. Glen Beck shines in finding and organizing facts and information in history to make a book that holds my attention. I disliked having to stop reading g but found the reading one chapter each day satisfactory. Thank you for a book written about people I would not known. Great stories about historical figures. It has just the right amount of detail for my liking. It's historical fiction, because he fills in the unknowns with his best guess. I prefer that he does it like that because it makes the stories more memorable. I think my favorite story is the one about Walt and Roy Disney. I like the tie-in of the last two chapters with Walt Disney and Steve Jobs. These gentlemen were dreamers with the heart to push forward until their dream came true. On the "Deceivers" stories what creeps we had in hiss, wilson, and fdr. We are now faced with problems today that they had started over 100 years ago. The one thing that's common between the successful people that the book talks about is an unwavering drive for success. Chapters 2 and 7 are about two geniuses (Alan Turing and Edwin Howard Armstrong) who helped other people/entities find success and met a tragic end despite their achievements. i say in non-fiction book from dollar store. and i grad it right away for my past time reading. This is an interesting book. some stories in out history that was not written. like the dark side story version that are true and has happened. interesting book. “...ten more true and untold stories...”?! None of these stories were untold! In fact, I could probably give a list of books that tell these same stories with more detail and with better writing. That being said, it could be called an easy-to-read compendium interesting stories? This was a good book of short stories. Some were more interesting than others, but overall it was good. Four stars because a few of the stories seemed like they went on too long. Stories about Lucy and Desi, Walt Disney and Epcot, Steve Jobs and other amazing people from our past. I learned something from this book. I would definitely recommend. I liked it! The apple-with-a-bite-out connection between Disney, Turing and Jobs was particularly fascinating. Excellent! As one reads this chapter by chapter, ones' curiosity grows deeper & deeper leading to a natural quest for more in-depth study into our nation's rich heritage and the American Dream. Glenn Edward Lee Beck is one of America's leading radio and television personalities. His quick wit, candid opinions and engaging personality have made The Glenn Beck Program the third highest rated radio program in America and Glenn Beck, one of the most successful new shows on the Fox News Channel. His unique blend of modern-day storytelling and insightful views on current events allowed him to Glenn Edward Lee Beck is one of America's leading radio and television personalities. His quick wit, candid opinions and engaging personality have made The Glenn Beck Program the third highest rated radio program in America and Glenn Beck, one of the most successful new shows on the Fox News Channel. His unique blend of modern-day storytelling and insightful views on current events allowed him to achieve the extraordinary feat of having #1 New York Times bestsellers in both fiction and non-fiction. Beck also stars in a live stage show and is the publisher of Fusion magazine.